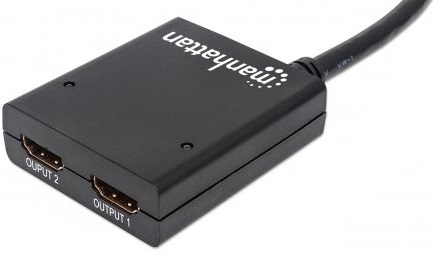 The Manhattan SuperSpeed USB to DisplayPort Adapter transmits PC audio/video signals to DisplayPort projectors, flat-panel displays, UHD TVs and other similar devices. Built-in circuitry easily distributes PC-based multimedia content on ultra high-definition displays and TVs while maintaining simultaneous A/V reception at the source PC. Its ultra high-definition capability supports up to 3840 x 2160,4K@30Hz, and to serve a wide range of resolutions in many PC and UHD applications including training, retail and trade show settings. 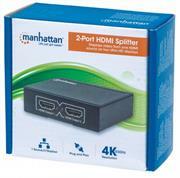 Windows and Mac compatibility makes it easy to set up the Manhattan SuperSpeed USB to DisplayPort Adapter. It effortlessly delivers digital content that's stored on desktop and notebook computers to other devices with DisplayPort input capabilities. 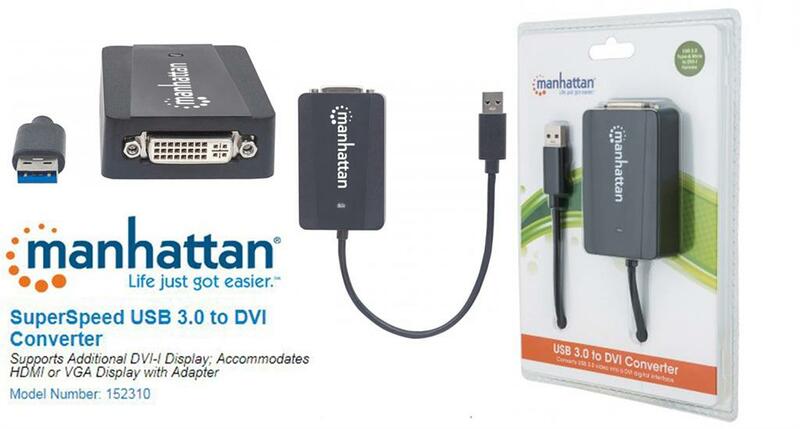 Manhattan HDMI Extends connection up to 50 m (164 ft.) between an HDMI source and an HD monitor or projector using one Ethernet cable (not supplied) Package Contents: 1080p HDMI over Ethernet Extender Kit (one receiver and one transmitter module) Power adapter (one unit) IR blaster and receiver (one unit each) Quick Instruction Guide, Retail Box, Limited Lifetime Warranty. Easily extend a high-definition signal via single Ethernet cable. 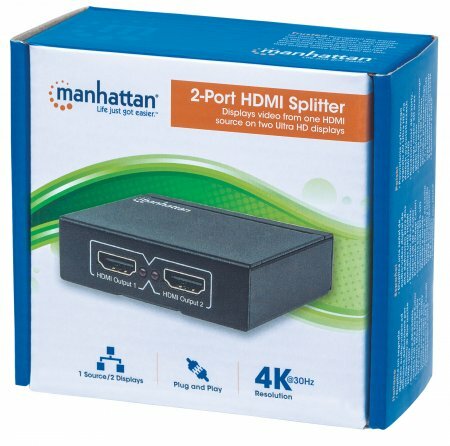 The Manhattan 1080p HDMI over Ethernet Extender Kit is the ideal solution for connecting virtually any HDMI source (PlayStation, Xbox, Blu-ray player, satellite receiver, digital recorder, etc.) to an HD display or projector up to 50 m (164 ft.) from its source via a single Cat6 Ethernet cable. 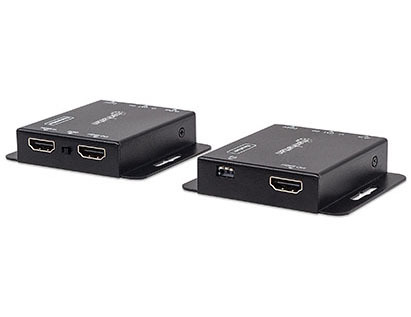 These powered HDMI Extenders provide reliable 1080p resolution video and multichannel audio transmission over longer distances than is possible with HDMI cables alone. Plus, the transmitter module has an additional HDMI output port, allowing a second monitor to be placed in a control closet or run to second display. 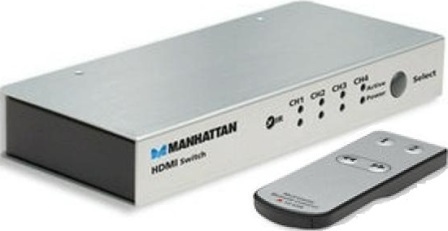 For additional quality control, the Manhattan 1080p HDMI over Ethernet Extender Kit includes an EDID control switch to minimize display issues, a built-in equalizer dip switch for long-run screen flickering corrections and a wideband IR blaster and receiver for remote control of the source device. 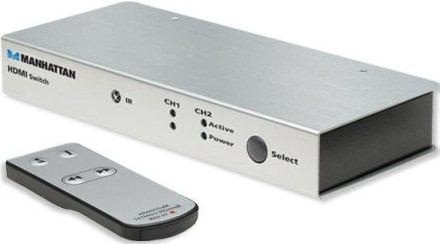 Ideal for trade shows, classrooms, home theater, conference rooms, business office and retail applications, the Manhattan 1080p HDMI over Ethernet Extender Kit boosts and extends a 1080p signal up to 50 m (164 ft.) for convenient display or projector placement. Ethernet cabling — Cat6 UTP, SSTP or SFTP (cables not included) — is less expensive and easier to install than HDMI cabling and in-line signal repeaters, and, when used with our Extender Kit, delivers a clear, sharp and vivid picture over longer distances. HDCP compliance with HDMI and DVI 1.0 means this Kit is tested to guarantee performance and reliability. It installs quickly without running software or installing additional hardware. It comes with a power adapter, which powers the receiver or transmitter over Ethernet for the unit using the power adapter, freeing up a power plug for more important applications. 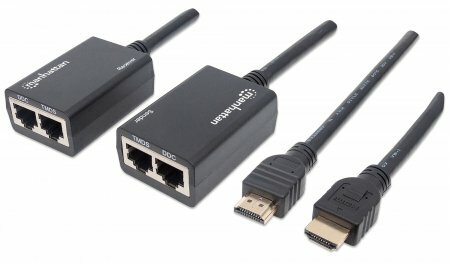 Easily connect another monitor, HD projector or another DVI device to notebook or desktop computers. 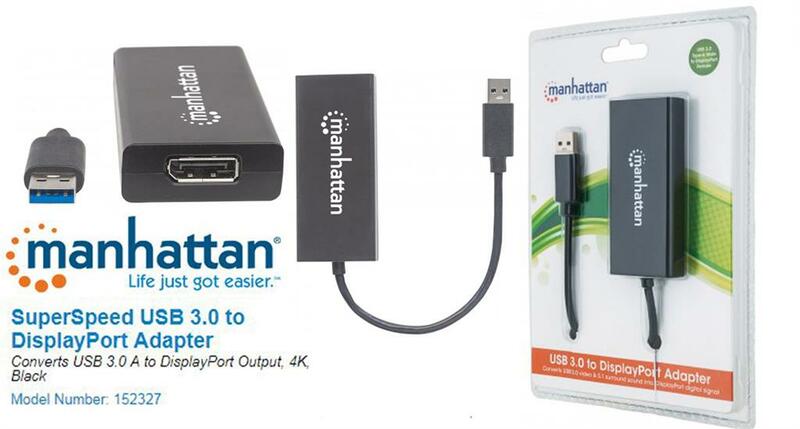 The Manhattan SuperSpeed USB 3.0 to DVI Converter increases productivity, improves "desktop" arrangements and extends the visual work area across multiple monitors. It makes word processing, editing and multi-tasking more effective with less overlapped windows, fewer hidden palettes and better-organized views. Read e-mail on one monitor and open attachments on the other. Expand and view large, complicated spreadsheets without scrolling. Make presentations more compelling with one display for attendees and one for the speaker to view notes. The convenient SuperSpeed USB 3.0 connection eliminates the need to install another graphics card or struggle with compatibility issues. It's an ideal, portable solution for notebook computers and desktop systems with graphics cards that lack additional outputs. With Plug-and-Play and hot-swap capabilities, it's easily installed without an external power supply on any Windows computer or Mac. 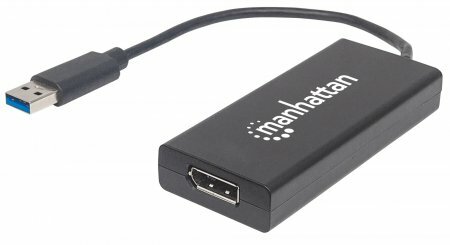 The MANHATTAN USB 2.0 to HDMI Adapter translates Analog PC audio/video signals and transmits digital output to HDMI projectors, flat-panel displays, televisions and other similar devices. Built-in circuitry allows digital media enthusiasts to easily distribute and enjoy PC-based multimedia content on high-definition displays and TVs while maintaining simultaneous A/V reception at the source PC. Its high-definition capability supports up to 1920 x 1080 and 1080p to serve a wide range of resolutions in many PC and high-definition applications, including training, retail and tradeshow settings. 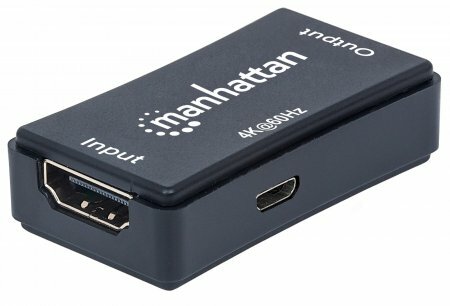 With Windows and Mac compatibility, the MANHATTAN USB 2.0 to HDMI Adapter requires no complicated configuration to convert and deliver digital content stored on desktop and notebook computers to other devices with HDMI input capabilities. 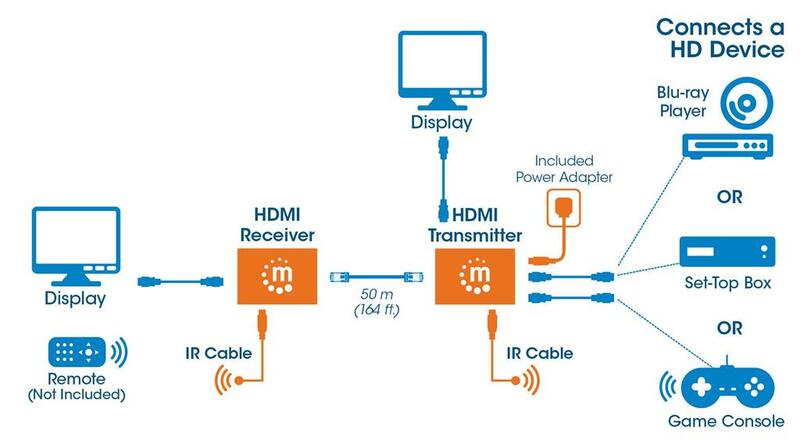 HDMI has become the standard digital connection, delivering the highest-quality audio and video signal over a single cable. Manhattan High Speed HDMI Cables are designed and carefully constructed to meet the evolving needs of the high-definition marketplace. 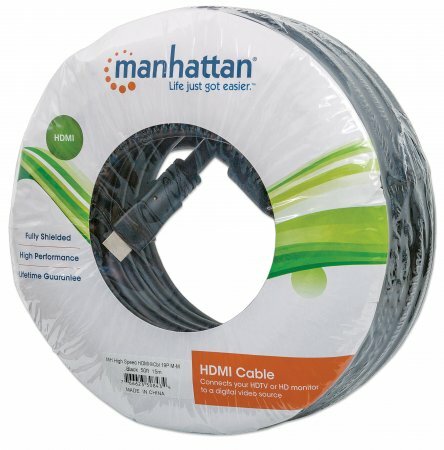 Manhattan High Speed HDMI Shielded Cables provide 1080p resolution and a bandwidth of 10.2 Gigabits per second at 340 MHz. These high-quality cables provide high-definition video and multichannel, digital audio with increased performance characteristics, greater accuracy and expanded features. Easily extend a high-definition signal using Cat5e or Cat 6 cables. The Manhattan Cat5e/Cat6 HDMI Extender lengthens long-distance HDMI (high-definition multimedia interface) transmissions from a Playstation, Xbox or Blu-ray player, satellite receivers, digital recorders, set-top box or other HDMI video source using Cat5e or Cat6 cables. Ideal for trade shows, classrooms, home theatre, conference rooms, business office and retail applications, the Manhattan Cat5e/Cat6 HDMI Extender boosts and extends a 1080p signal up to 30 m (100 ft.) for convenient display or projector placement. 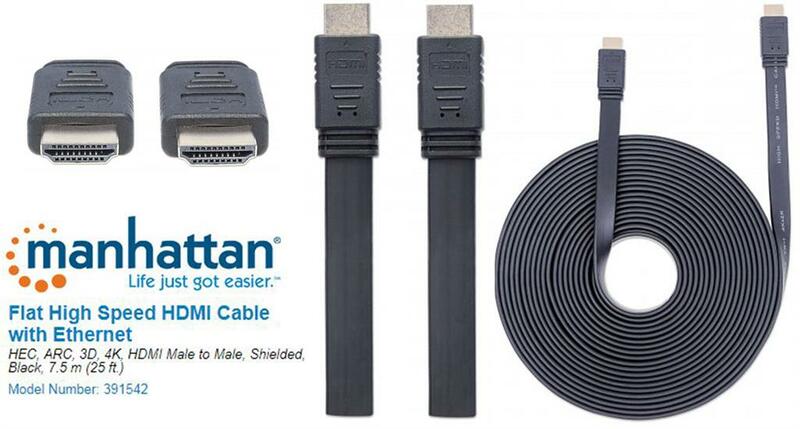 Less expensive, easier to install and readily available, Cat5e or Cat6 twisted-pair cables when combined with the Manhattan Cat5e/Cat6 HDMI Extender help provide additional protection from external interference over longer distances and customized lengths without signal degradation. Fully HDCP compliant with HDMI 1.2a, HDCP 1.0, 1.1 and DVI 1.0 ensures that the Manhattan Cat5e/Cat6 HDMI Extender provides long, reliable service in many installations. Quickly connect Cat5e or Cat6 cables (not included) and the power supply without software or hardware configuration or complicated settings to complete an affordable extended HDMI application. The Manhattan CL3 High Speed HDMI Cables are rated for in-wall installation and feature an abrasion-resistant design, a sturdy yet flexible PVC jacket and gold-plated contacts. Created to meet the evolving needs of the high-definition marketplace and fire protection standards, this cable provides the highest resolution possible at 4K x 2K, an audio return channel and a bandwidth of 18 Gbps at 600 MHz These high-quality cables deliver high-definition video and multichannel, digital audio with increased performance characteristics and greater accuracy. With its fully tested high specifications and in-wall fire rating, the Manhattan CL3 High Speed HDMI Cable will future-proof your Audio/Video project for years to come. High Speed Cables deliver high-definition performance. 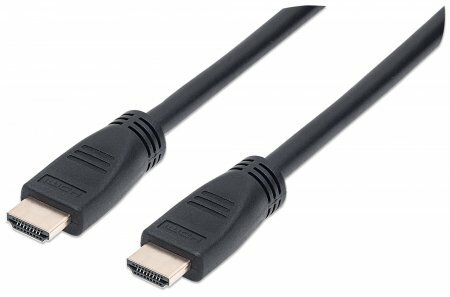 HDMI has become the standard digital connection, delivering the highest-quality audio and video signal over a single cable. Manhattan High Speed HDMI Cables are designed and carefully constructed to meet the evolving needs of the high-definition marketplace. Manhattan High Speed HDMI Cables provide the highest resolution possible at 4K x 2K, an audio return channel and a bandwidth of 10.2 Gbps at 340 MHz. These high-quality cables provide high-definition video and multichannel, digital audio with increased performance characteristics, greater accuracy and expanded features, including Internet connectivity for home entertainment devices using a single HDMI connection. 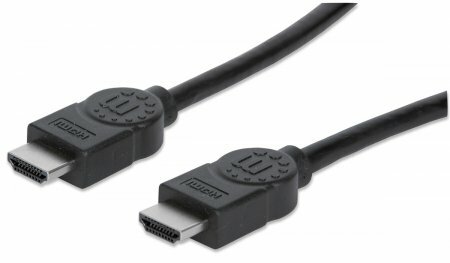 TrendNet (TUC-HDMI) USB Type C to HDMI 4K UHD Display Adapter - Connect an additional high resolution monitor to a workstation in Extend Mode, View a computer HDTV display up to 3840 x 2160 resolution at 30 Hz, Powered by the connected computer, Compatible with USB TYPE-C port, Compatible with Windows® and Mac® operating systems, Retail Box, 1 year Limited Warranty. 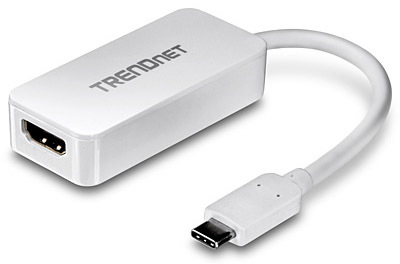 TRENDnet’s USB-C (TYPE-C) to HDMI 4K UHD Display Adapter, model TUC-HDMI, adds an HDTV or UHD monitor to a workstation. 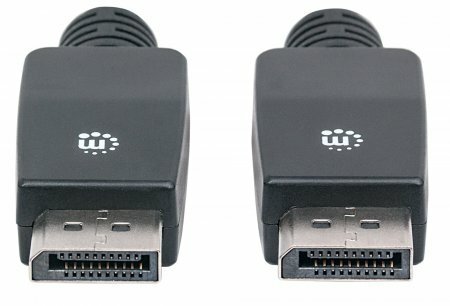 Extend or duplicate a computer display to an HDTV or monitor. Experience flawless video with the USB-C to HDMI connection. The adapter is powered by the connected computer and is compatible with Windows® and Mac® operating systems. Unlock workstation efficiency by adding multiple large screen HD displays to your workstation (one TUC-HDMI per display). Combine multiple displays into one viewing field with Extend Mode or repeat a viewing field to another display with Mirror Mode. 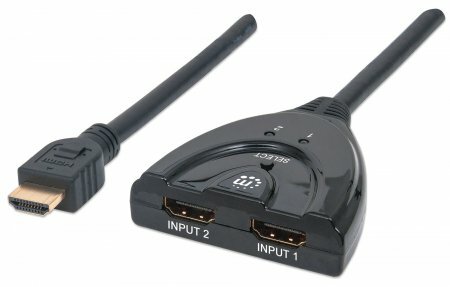 Connect the high speed USB-C port to your computer, then connect the HDMI cable to your TV to stream HD video. Manhattan SuperSpeed+ USB-C 3.1 to DVI Converter - C Male to DVI Female, Black, Retail Box, Limited Lifetime Warranty. 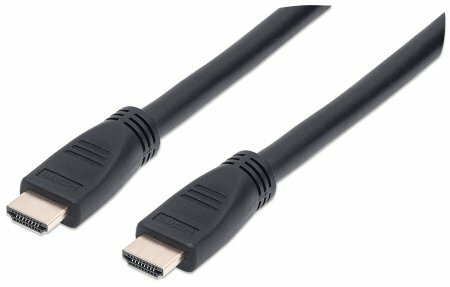 Easily connect a USB type-C source with a DVI display. 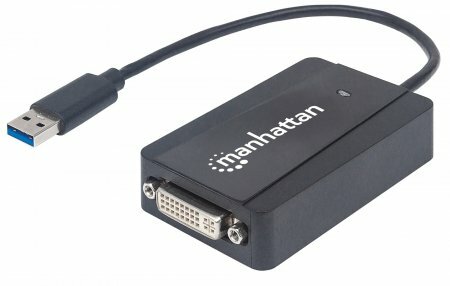 The Manhattan USB 3.1 to DVI Converter establishes a fast, simple and convenient link between newer USB type-C equipped media sources (computers, tablets, etc.) and existing DVI displays (monitors, projectors, etc.). 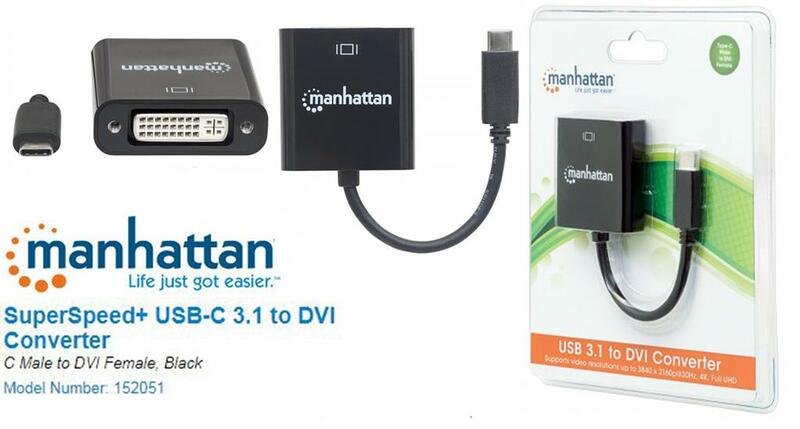 The Manhattan USB 3.1 to DVI Converter is easy and quick to install--no complicated configuration or setup required. Its all-in-one design achieves a compact, integrated solution that eliminates unnecessary cables, tangles and clutter to keep installations and work spaces neat and orderly. 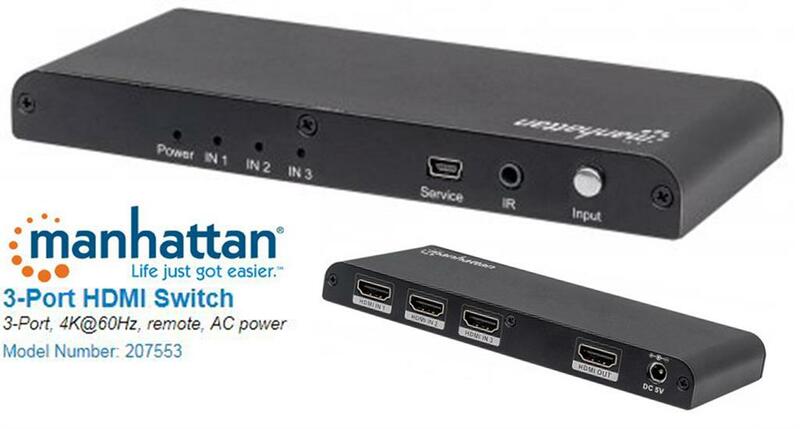 Extend the service life of your equipment, and fully realize the investment and value of your DVI displays, projectors and peripherals with Manhattan USB 3.1 to DVI converters. 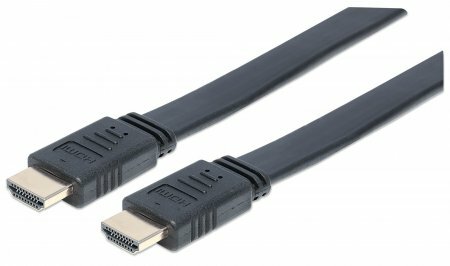 Easily connect a Mini DisplayPort source with an HDMI or VGA display. 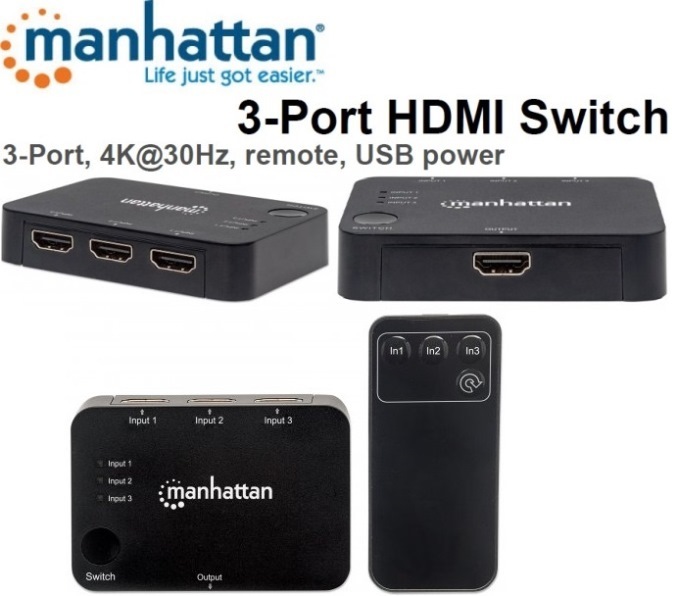 The Manhattan 2-in-1 4K Mini DisplayPort Adapter establishes a fast, simple and convenient link between Mini DisplayPort-equipped sources and existing 4k HDMI and 1080p VGA displays. The adapter is easy and quick to install and requires no complicated configuration or setup. It offers a passive, compact and integrated solution that eliminates unnecessary cables, tangles and clutter to keep installations and workspaces neat and orderly. 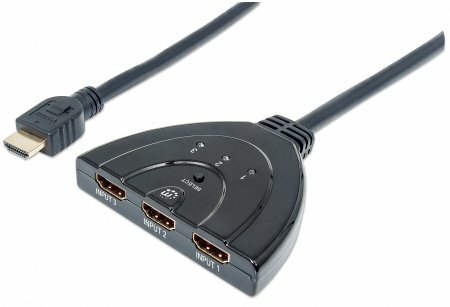 Easily connect a DisplayPort source to an DVI-D display. 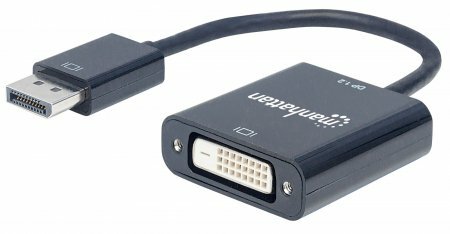 The Manhattan DisplayPort Adapter helps establish a fast, simple and convenient link between newer DisplayPort-equipped sources and existing DVI-D displays. 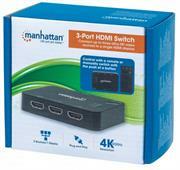 The Manhattan DisplayPort Adapter is easy and quick to install. No complicated configuration or setup is required, which helps fully realize the investment, value and service life of DVI-D displays. Its all-in-one design is a compact, integrated solution that eliminates unnecessary cables, tangles and clutter to keep installations and workspaces neat and orderly. 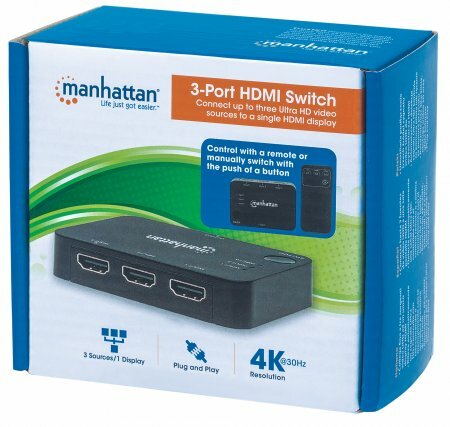 Manhattan DisplayPort Cables deliver both high-definition digital audio and video signals between desktop or notebook computers and an output device. 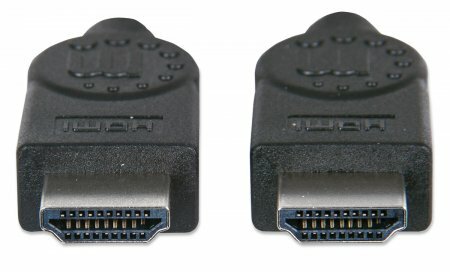 The 20-pin connector is small and compact but offers 10.8 Gbps bandwidth, Deep Color and 24-bit, 8-channel uncompressed audio capability. 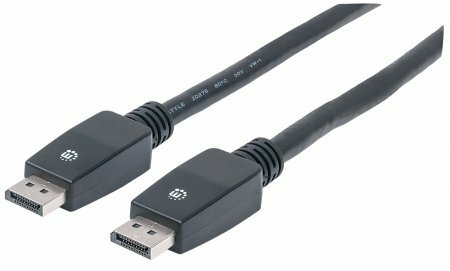 It's ideal for use with DisplayPort-equipped computers, flat-panel displays, slim-profile devices and many consumer electronics including Blu-ray players and game consoles. Full foil and braided shielding, molded boots with strain relief, protective PVC jackets and gold-plated connections ensure that Manhattan DisplayPort Cables provide maximum conductivity and clear, crisp signal transmissions with reduced EMI interference and distortion. 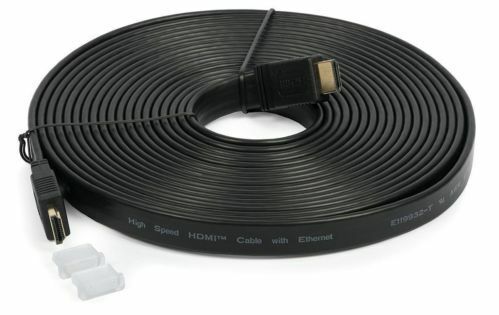 High Speed Cables deliver high-definition performance with no tangles.. HDMI has become the standard digital connection, delivering the highest-quality audio and video signal over a single cable. With a flat, tangle-resistant design, gold-plated contacts and a sturdy yet flexible PVC jacket, Manhattan Flat High Speed HDMI Cables are designed and carefully constructed to meet the evolving needs of the high-definition marketplace. 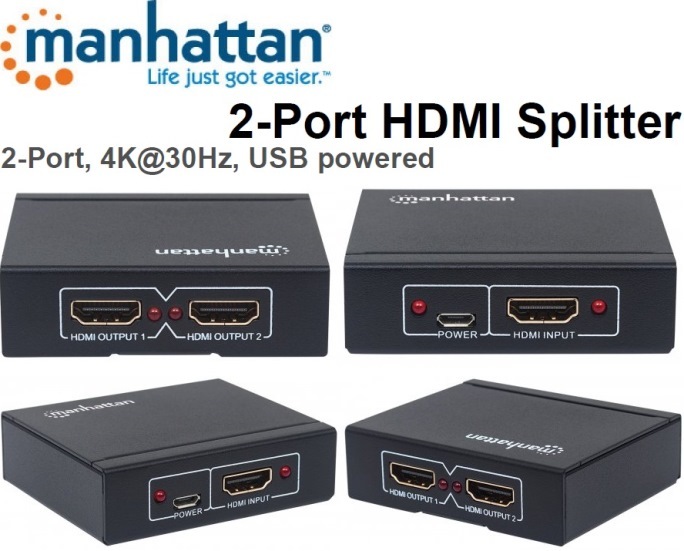 Manhattan High Speed HDMI Cables provide the highest resolution possible at 4K x 2K, an audio return channel and a bandwidth of 10.2 Gbps at 340 MHz. These high-quality cables provide high-definition video and multichannel, digital audio with increased performance characteristics and greater accuracy. Expanded features include Internet connectivity for home entertainment devices using a single HDMI connection. 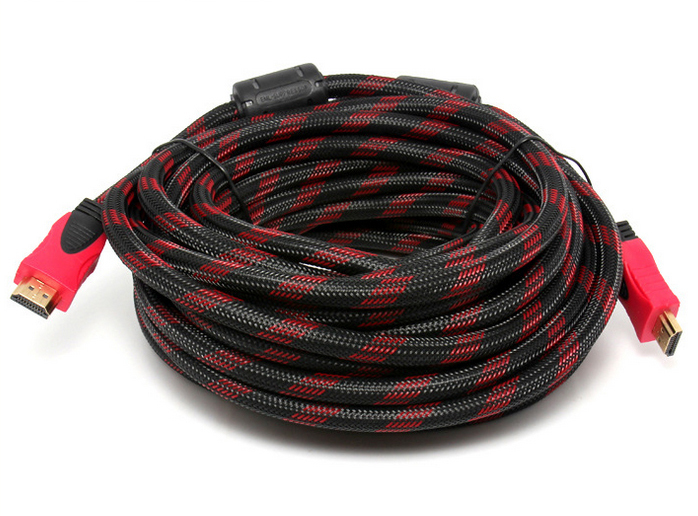 Plus, this cable's unique design makes it easy to roll up or out without worrying about snags and tangles.